From New England, The united States, International and a Legends Category. The below list of artists is broken into four sections; New England, United States, International, and The Legends. If we have a review on file for the particular artist, it will be hyperlinkd right below the artist's name. Hailing from Connecticut, AFTER THE FALL have been around since the late 1980's and their line-up consists of Mark Benson (vocals, guitars), Ken Archer (keyboards), Jeff Brewer (bass, percussion, vocals) and Rich Kornacki (drums, percussion). An instrumental Prog Rock band from Massachusetts blending elements of ELP, KC, and others and featuring classic keyboard/synth sounds. Forever Einstein is a three piece band playing original instrumental music that incorporates a truly broad range of influences. Prog metal outfit from Boston. Jay Wasco - Trumbull, CT.
Jay Wasco of Johnny Skilsaw fame finally got the gumption to throw a camera in the corner of his Trumbull CT studio to share how he has no regard for what is normally possible. Composer, saxophonist, flautist, and percussionist from Birdsongs of the Mesozoic and Sesame Street! If one musician could walk several paths at once, this music is the end result. 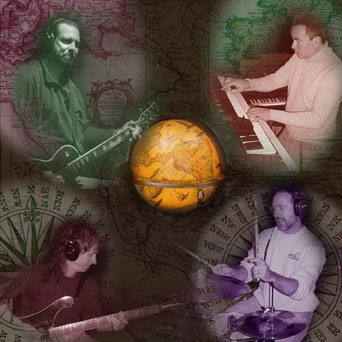 Heavy progressive rock with world music influences. Novel, eclectic, hard to describe: A Clown Car with an afterburner. I guess you just got to hear it. Rich Casey - Waltham, MA. "Progressive rock even your girlfriend will like!" Our sonic landscape incorporates an eclectic mix of mellotron, Hammond organ, growling bass, crunch guitars, and layered vocals. Psychetronic Rock. This could be described as Pink Floyd meets modern electronica, with heavy influences from Ozric Tentacles, Legendary Pink Dots, Nine Inch Nails, and quite a few others. Turning heads every time they take the stage, UBS quickly becoming one of the hottest live music acts in the Northeast. An Adult Alternative/progressive pop band from Manchester, New Hampshire. The official fan site of the rock band, Waltham. Music refreshingly reminiscent of the Eighties. Jessies Girl grows up. Boston-based progressive rock band with some Tull influence. Afterlife - Long Island, NY. A band of five veteran musicians from Long Island who perform the classic progressive rock of the 70's and 80â€™s including Yes, Kansas, Rush, Genesis, ELP, UK and more. The premiere prog metal band; virtually invented the genre. Without question one of the brightest lights on the American symphonic prog scene, IZZ melds classic and modern prog influences, strong melodies, complex male-female multi-part vocal harmonies, and stirring guitar and synthesizer solos into a familiar yet refreshing musical stew. The new IZZ album "My River Flows" shows the band’s full musical palette: from accessible yet complex songs mixing their Yes, Beatles, and Gentle Giant affinities with a Radiohead spice to a dynamic, spiritually uplifting multi-part symphonic suite. an instrumental rock-fusion band based in Raleigh, NC. Originally known as Cloud Nine. Prog/jazz fusion with a touch of humor. Sonus Umbra is a dark progressive hard rock band. The Waiting Room "A Tribute to Genesis and Peter Gabriel - Buffalo, NY. A new progressive rock band from Chile. DREAM ARIA is in a class all its own with fresh, fiery and haunting music. Elements include Rock, Techno, Progressive, Classical, New Age, Goth, and World music. Making quality music for over 30 years! The Lee Saunders' project, 'The Puzzle', has been designed to look at key pivotal events of the 20th Century that have shaped the world in which we live today. The Watch is a 5-piece band from Milan, Italy. Born from the ashes of The Night Watch, they began to work in a more professional way with the release of Ghost in 2001, the album that introduced them to prog audiences. Today, The Watch are a well-known act in the prog community and are definitely appreciated. Their music is inspired by artists of the 70's, primarily early Genesis, owing to an incredible similarity between Simone Rossetti's vocals and those of a younger Peter Gabriel. Despite this similarity, however, the band has its own style, combining classical prog atmospheres with a sprinkling of modernity. During interviews, the guys are often asked how they manage to attain such a high production level both in-studio and on stage. They like to say that they simply try to compose nice songs and nothing more. The Watch's latest effort, Vacuum, instantly received excellent reviews. With its release in November 2004. A brand new album; both are scheduled for 2007.